Saree printing is process of applying color to fabric in definite patterns or designs. The color is bonded with the fibre, so as to resist washing and friction, that is called propery printed fabrics. This type of printing is related to dyeing but in dyeing properly the whole fabric is uniformely covered with single color, but in printing one or more colors are applied at particular areas to it and it sharply defined the patterns. Actual printing originating in China. 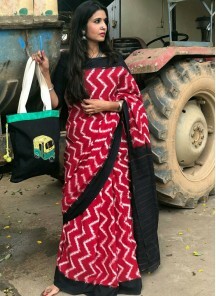 Traditional textile printing techniques are broadly categorised as direct printing, the printing of a mordant in the desired pattern prior to dyeing cloth, resist dying and discharge printing. Again there are several methods of printing categorised as hand block printing, parrotine printing, engraved copperplate printing, roller, cylinder or machine printing, stencil printing, screen printing, digital textile printing. 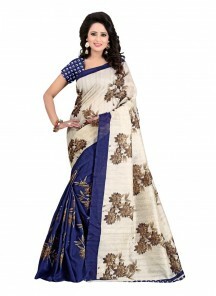 Printed sarees are best to wear at any occasions like wedding, festivals or casual gatherings. If you want a casual look buy printed sarees online at LadyBaazar. LadyBaazar is collection of latest printed sarees designs. Buy printed sarees online at our store which gives you easy and time saving online shopping. It will save your as you don't neeed to go any botique. We also provide customized stiching for your desired measurements. 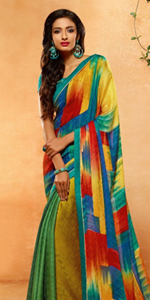 LadyBaazar is the only place which makes your printed saree online shopping easy. We provide best quality product with on time delivery worldwide at affordable shipping cost.